By Yinka Kolawole & Elizabeth Adegbesan, with agency report The Central Bank of Nigeria (CBN) said it will introduce new capital requirements for banks in the second quarter of 2019, a move that threatens to heap pressure on lenders already weighed down by bad loans. The apex bank told Bloomberg, yesterday, that the new requirements will be stricter in terms of what funding qualifies as capital and will also require lenders to create “capital conservation” and “counter-cyclical” buffers. 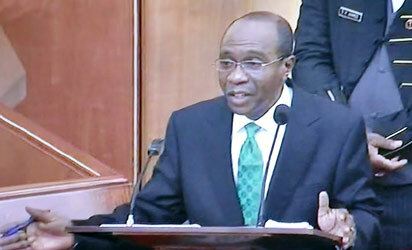 According to CBN, the rule seeks to protect the nation’s banks “against shocks emanating locally and from abroad” by increasing the level of regulatory capital and the quality of the assets with the introduction of the new rule, the regulator seems to be aligning itself with a global accord known as Basel III, three years after a contraction in Nigeria’s economy spurred delay of implementation of tougher capital rules. It also comes after policy makers in 2013 spurned some requirements drawn up by the Basel Committee on Banking Supervision. Last year, banks were compelled to migrate to a new accounting standard known as IFRS 9 to improve disclosure by forcing lenders to provide for existing losses as well as those that might occur in the future. While the average capital-adequacy ratio for the industry rose to 12.1 percent in June from 10.2 percent at the end of 2017, some banks said the transition shaved as much as 200 basis points off their capital bases. Return unfit notes to CBN branches In another development, the CBN said that members of the public should return unfit naira notes to banks or any of its branches for fit notes. It however warned the nation’s banks against recirculation of unfit bank notes, saying that it would impose penalties on any bank that re-circulates unfit bank notes. The CBN disclosed this in the Banknotes guidelines issued yesterday alongside Clean Notes Policy. The documents were signed by Deputy Governor Operations, CBN, Folashodun Shonubi and Director Currency Operations Department Mrs. Priscilla E. Eleje. Among other things, the guidelines describe fit and unfit bank notes as well as stipulate Quality Standard for Nigerian bank notes. The guidelines stated: “A banknote that is suitable for continued circulation and is sufficiently clean to allow its authenticity and value to be readily ascertained. “A banknote that is unsuitable for further circulation because of its physical condition, which may be soiled, dirty, limp, worn out, defaced or has a hole that is larger than 10 mm. Unfit notes should be returned to DMBs or a branch of the CBN anywhere in Nigeria for exchange.” Explaining the purpose of the guidelines, the CBN stated: “These guidelines provide the general public with clear, acceptable criteria and standards for determining the quality of banknotes in circulation. The guidelines spell out the criteria for re-circulating a bank note, saying, “A banknote is considered fit for recirculation if it meets the following criteria:-Genuine, not counterfeited; Has a defined and acceptable area dimension; Free from holes, tear, tape or missing part, folded portion, etc; Has uniform brightness and is not heavily soiled; Free from excessive ink wear, particularly in the portrait area; Free from defacing; Correct denomination, serial number details, etc; The series that has been approved for redistribution by the Bank. If one or more of these criteria are not met, a note can be classified as unfit and unsuitable for recirculation.” “To ensure that the banknotes in circulation are clean and of good quality, DMBs shall ensure that they process their banknotes using registered processing companies and classify them into fit and unfit. “Any counterfeit notes discovered are to be returned to CBN. Only the banknotes which have been authenticated (i.e. verified for counterfeit and free from unfit notes according to CBN standard) will be issued over the counter by banks or through their cash dispensing machines. “Unfit banknotes shall not be re-circulated by DMBs and CPCs. More-so, a penal charge of N12,000 per box, or any amount determined by the Management of the Bank, shall apply for the deposit of unsorted banknotes. In addition, penalties as may be determined by the Bank, shall apply for the re-circulation of unfit banknotes. ALSO READ: FG to borrow N823b through treasury bills in Q1’19 “There are machines that accept, count or sort banknotes automatically into fit, unfit, suspect or counterfeit. Only cash processing machines which have been duly configured, and approved by the Bank shall be used by CPCs. The following categories of machines must meet specified standards set by the Bank and be adaptable to the features of the existing banknotes and the basic parameters set by the CBN from time to time. The Bank shall ensure conformity to these standards: Desktop sorting machines with authentication sensors; Banknote validators; Medium speed note sorters; High speed sorters; Automated Teller Machines (ATMs). The processing equipment would be adapted and confirmed by CBN to ensure uniformity and consistency with defined parameters. “The Bank shall ensure that the Automated Teller Machines (ATMs) deployed by DMBs and other service providers are configured to dispense and accept only genuine banknotes in all denominations. “The ATMs shall dispense notes that have been duly checked for authenticity and fitness according to the Bank’s standard and operators who’s ATMs contravene this provision shall be sanctioned according to section 20 of the CBN Act. Similarly, DMBs and service providers who’s ATMs receive or dispense counterfeits or materials other than naira banknotes shall be liable according to section 20(4) of CBN Act 2007.” On steps to be taken by stakeholders in the currency management system to ensure that notes in circulation are of acceptable quality and standard. The CBN said: “The quality of banknotes must be checked in the course of withdrawal by all the major cash handlers. “The DMBs and third party service providers are advised to adhere strictly to the provisions of the Guidelines as any violation would attract appropriate sanctions. “Fit banknotes should be re-circulated to the public, while unfit banknotes are to be returned to CBN for authentication and disposal. All banknote processing machine parameters must be configured in line with the quality criteria set by the Bank to ensure consistent quality output. The rate at which top banks are collapsing in Nigeria is alarming. Hope CBN will always check well to affirm their policies are more of benefits to the banks too.